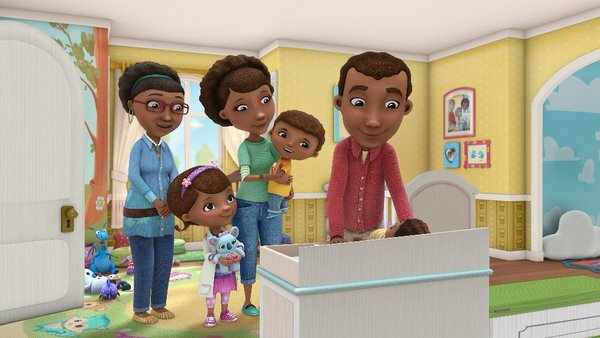 Disney Junior’s Doc McStuffins recently ran a five-episode storyline where the McStuffins family brought a new baby into their home, through adoption. The third episode, “Hootie’s Duty” shows the McStuffins family as they prepare for a baby shower. 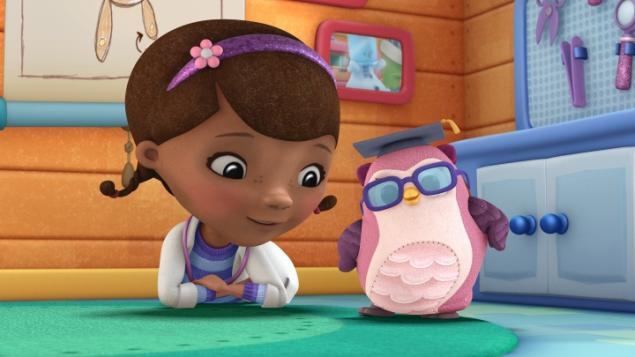 Doc’s wise owl toy, Professor Hootsburgh, is charged with training the baby’s new toys on how to be good toys. In order to prepare herself for life in the nursery, Professor Hootsburgh gets subjected to messes, and she is slobbered on by a couple toys. 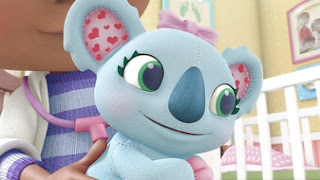 Doc McStuffins intelligently shows many different types of anxiety that youngsters might feel about an upcoming addition to their family, but assures them that “a cuddle and a smile makes it all worthwhile,” and promises, “Act with love, and you’ll do just fine.” A character explains that, although she was nervous, she’ll do “whatever it takes” to make sure that the baby is cared for. 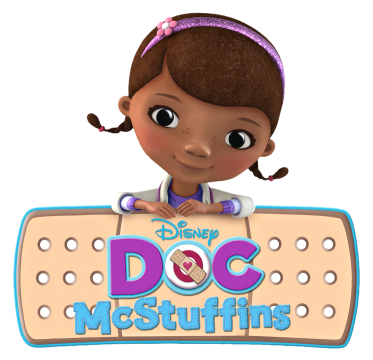 Overall, Doc McStuffins covers a range of fears and questions that kids might have about adoption, and does it with warmth, humor, and reassurance. Job well done, Disney! Personally, I feel that the way the show handled the adoption process was rather vague. The facts stated about adoption are very basic (“Our baby will come from another mom” etc.) If a few details were edited or removed, it wouldn’t feel much different than if Mrs. McStuffins herself was having the baby. Arthur handled this better by not only giving a more detailed explanation of everything that goes into the adoption process, such as filling out forms and meeting with a Social Worker, but the families also exchange letters and pictures. Also, the entire family travels to the birthplace to meet the child. At first I thought that Disney was trying to portray a closed adoption. However, this was disproved when the parents mentioned that the birth mother liked the name “Alana.” This shows that the parents must have had at least some communication with the birth mother. The episode “Bringing Home Baby” really emphasizes how much wasted potential there was. Instead of further explaining the adoption process, much of the episode focuses on how each of Doc’s toys came to be. This is nice, but it could have been saved for another episode. Since so many important details were left out, kids will still have questions that were left unanswered. Such questions include: “Why would the mom give her baby to another family?” “How does adoption work?” “Why does it take so much work to adopt a baby?” “Why do people adopt babies?” “How will the baby feel about being part of a different family?” and “Will the baby know he/she is adopted?” I understand that adoptions can be a long and complicated process which is why it’s often best not to focus this storyline on the main character. Mister Rogers Neighborhood and Sesamee Street explained this topic using side characters which allowed them more freedom to give better explanations of how the adoption process works. I admire Disney for attempting to tackle such a topic as adoption, but their episodes didn’t give enough of a thorough explanation. I'm really glad that you commented. You've got some great insight here. Like you, I'm glad that Disney is including adoption as a way that families are formed, I think that it might give kids a head start on conceptualizing it, but you're right that Doc McStuffins' treatment of adoption isn't really thorough. The questions you ask are all very important questions and it would be wonderful to see a kids' show tackle them. I'm wondering how Mr. Rogers handled it, and I did review the Sesame Street episodes, and thought they did pretty well, but again, not completely thorough. Thanks for such a well-thought out and articulate response. If you wanted to write a review of these episodes, I'd be glad to post it. Or - if you wanted to write a review of the Arthur or Mr. Rogers episodes, I'd be glad to post that, too. I'd be glad to introduce those episodes to the folks who read this site.